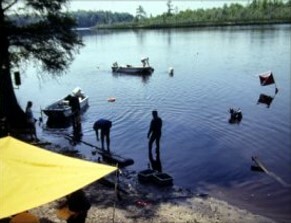 North Carolina General Statute 121-25 states that "Any qualified person, firm or corporation desiring to conduct any type of exploration, recovery or salvage operations ... shall first make application to the Department of Cultural Resources for a permit or license to conduct such operations." Although these permits are currently issued at no charge, G.S. 121-25 allows for the payment of a fee at the Department's discretion. Over the past 20 years, the UAB has issued 115 permits. Those permits have gone to a variety of individuals, groups, agencies, and institutions for a wide range of research projects.